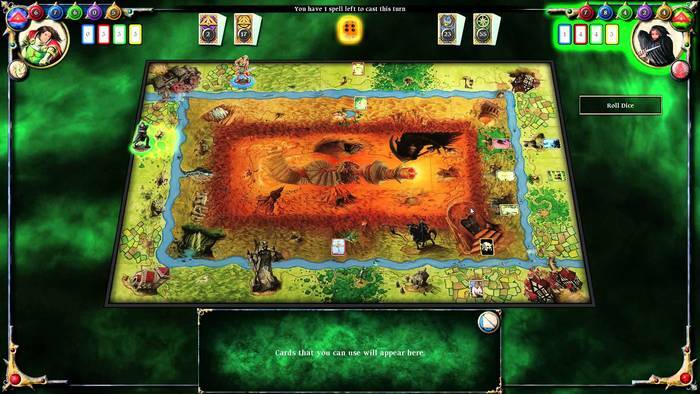 Based off the board game, Talisman: Digital Edition tries to bring the fun from the tabletop to consoles and PCs. While I can’t comment on how entertaining the actual board game is, it seems likely that something was lost along the way during the transition to video game. Talisman is a turn based game that pits you against other human or AI characters. The goal is to reach the center of the board and kill off the remaining characters. There is a plethora of characters to choose from (especially with DLC expansion packs) that all have their own advantages and disadvantages. You draw adventure cards when landing on certain tiles which may give you items, monsters to fight, or an event that causes some effect to your, or someone else’s, character. Item cards increase your stats or help your character through certain situations. Monsters take a life from you if you lose, or nothing, most of the time, if you kill them. You can also attack other players if you land on their spaces in order to take their items or a life. Without any experience playing the tabletop version, I found it very difficult to get a grasp on Talisman. The “tutorial” is not easy to follow and only shows “hints” when a situation occurs instead of giving a set of rules or guidelines before playing. A mock tutorial game or even just a written “how to” list would have been extremely helpful, but it just isn’t there. It took me multiple games for me to get the hang of what I was doing, which, if my ability in the game is any proof of, was still not that great. While playing Talisman: Digital Edition, I could tell that it was not made with PS4, or consoles in general, in mind. Touching the touchpad brings up a cursor on the screen that can’t actually click anything. There are buttons on the screen that aren’t “selectable” but pressing certain buttons causes them to make animations like they were “clicked on.” The left thumbstick has you select the different players and see what items they are holding, but doesn’t let you navigate the board or select important cards when prompted. Those jobs fall to the D-pad which was just confusing and seemed unnecessary. It is clear that Talisman: Digital Edition was meant for the PC. I am sure that there are many things that could have been done to make Talisman: Digital Edition more enjoyable, but you really have to force yourself in order to like this game as it is currently. If you are really looking for a “Talisman” experience, you may be better off grabbing a few friends and heading to a tabletop.